EXPLORING THE FOUQUET’S BARRIERE (SECOND PART)It’s amazing how going through these images gets me instantly back into this incredible trip to Paris that we enjoyed right before Christmas holidays. James and I were in the city in order to shoot a big project with Kérastase which will be released this year and we took advantage of the trip to extend our stay for a few days and explore a little bit Paris. All of our trips are usually so short, that we never have time to discover properly the city. Especially since we come to Paris mostly during fashion week month and spend most of our time in cabs or in the metro. This time, it was the ideal moment to take this chance. Paris in winter, and more precisely during Christmas time is pure magic. The streets are so bright and shiny. The shops are full of warm colors, candles and shiny goods. The restaurants are so cozy and well… There’s definitely something magical in the air. 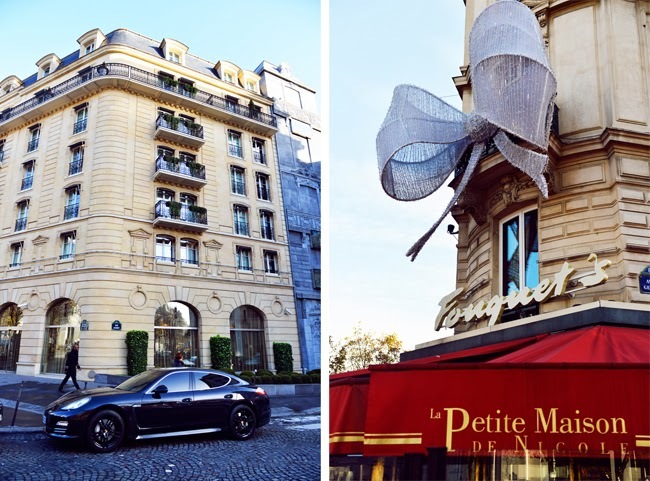 One of the greatest things about staying at the hotel Fouquet’s Barrière is that it is located right on the Champs Elysées. It was so amazing as we were close to everything and spent our afternoons walking, heading to avenue Montaigne, enjoying the Rue Cambon and the jardin des Tuileries. Getting a little lost and buying lots of chocolates and macarons. We got lucky with the weather too. There was a golden glow illuminating our rooms back at the hotel and one thing for sure is that it was super tempting to stay in and just enjoy this pure moment of bliss. 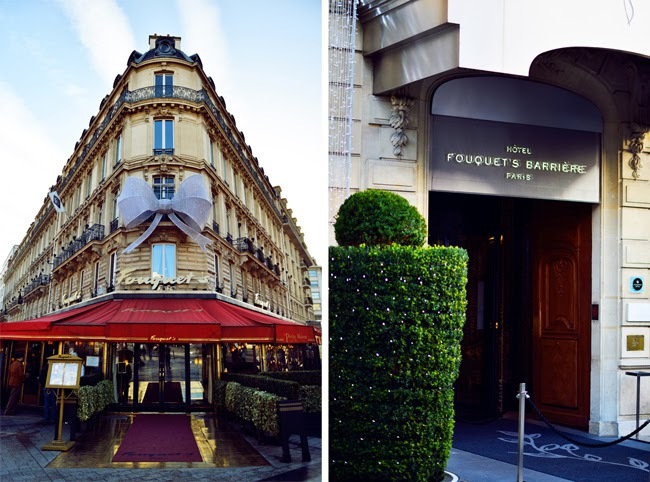 If you’re ever in Paris make sure to stop by the Fouquet’s Barrière, even if you aren’t looking to have a stay you can always enjoy some delicious cocktails at their bar or have a lovely dinner at one of their restaurants before having a long walk on the champs. They have an inside pool and spa as well (quite uncommon for a parisian hotel! ), so if you’re ever looking to pamper in the middle of a busy day or willing to offer a nice gift to one of your beloved ones : that’s the spot! these photos are absolutely beautiful Kay, the hotel looks like a fairy-tale castle. You're a lucky girl, I hope you know that. Good look with your singing career! Awesome pics! Just love Paris! These pics are so amazing, this pull looks so cozy and warm, the colour looks perfect on you! So pretty and elegant. Love your green outfit! Oh God, I love Paris, it's an amazing city, very beautiful. You look gorgeous. Beautiful photos! You look stunning in that green emerald color! It looks like you had a great trip! amazing pictures! Gorgeous style and incredible photos ! Love the place to be there ! Amazing Paris can never stop amaze anyone. Wow, soo nice pics and must be great there. And Paris in a different perspective ! What beautiful photos of my adoptive city! Paris is magical, and you've done an amazing job of showing that through these pictures. I wish you the best for a wonderful 2014 & on your new singing career! Wow those are amazing photos! Perfect for an editorial! wow,beautiful photos! Also you are sooo gorgeous! Amazing post, such a wonderful place, thanks for sharing dear! Absolutely beautiful shots! You are lucky to travel that much! These photos are so beautiful. Happy you had a great time! I would love to see a hair tutorial for this low bun you've been wearing, it's so classy and elegant. Gorgeous! Do you have any link or similar to where I can purchase the Jo No Fui top that you're wearing? I'm soo in love. The colors are amazing, beautiful photography! you look so great in these photos! looks like the Palazzo Versace! Gorgeous photos! I'm happy for you that you actually got to explore the city this time. Seriously James is an amazing photographer. Looks like a magical trip and congratulations on your new partnership! As much as I love the pictures of your posts, for quality, I've begun to notice -or feel like- the set of photos of each post resemble the others, some how, even though they are in different places and with different outfits and therefore give different vibes, they look very similar (to me). I don't want to say something and just leave it out there unexplained, so I'm going to give some examples of the concept or description of each photo is repeated in all the posts : there's the up-close pictures of Kristina's face, there's the up-close but not sutil pictures of the pieces that make the outfit usually shoes bags and accessories, then there's the picture where K looks at herself in a mirror with a lost look, the ones where you are walking taken from different angles, the one where you are taking some me time reading blogging or eating, you know what I mean? At this point these are the pictures that are expected in a usual post on your blog, so I feel like its time to switch it up, to take it to a new level, like : do actual editorials where there is a concept, a story, where you say something, instead of doing the now typical "we are in this place and I'm wearing this outfit" thing, which is -btw and also an awarded praise- still way better than the "look at me wearing this outfit" thing most "fashion" blogs do. I've been following your blog for a very long time and you have such great skin, I just wish it would look normal again as it used to look in your photos. you look so beautiful ♡ lovely post with lovely pics! Sorry but these pics are sooooo bad! Beautiful pics ! Love Paris and great hotel !! I am always wondering if you earn much money with your blog and modelling. I mean... you bought a Chanel bag last year and you wear nearly only designer clothes. Do you buy them or do you just lend the clothes and send them then back? Like a living advertisement for the brands? Oh my god, I found evidence in facebook! You really OWN ALL the clothes!! A picture from the 9th of December shows a picture of you in your wardrobe. How can it be that you have sooo much clothes. This can´t be normal. I love it when you wear green, makes the colour of your eyes pop out magically!!!! You look amazing wearing this green sweater! Paris is incredible & you look beautiful! I have never been in Paris but I really want visit this amazing city<3! I love photos with you! I need to go to Paris some time, too! Gorgeous pictures! You look like a model! I love everything! I love the photos! I am in love with these pics ! How adorbs is this big bow at the front of the hotel stepping in must feel like opening a gigantic present! Best of luck in your singing career you can do it. several yummy cocktails from its club or maybe have a very lovely dinner from among its eateries before working with a long go around to the champs. They want a good within pool in addition to health spa also. so if you're ever wanting to moisturize in the center of any hectic morning or maybe ready to give a good present one of one's precious versions. Stunning pictures and love your outfit! Nice pics!!! You look amazing. Those pictures of you in the Balcony are stunning! I also love your green sweater, it looks great on your skin! Beautiful pictures! I love your blog so much!!!! So stunning, Your make-up is so clean and simple, your outfit is amazing and I love those shoes. Beautiful!